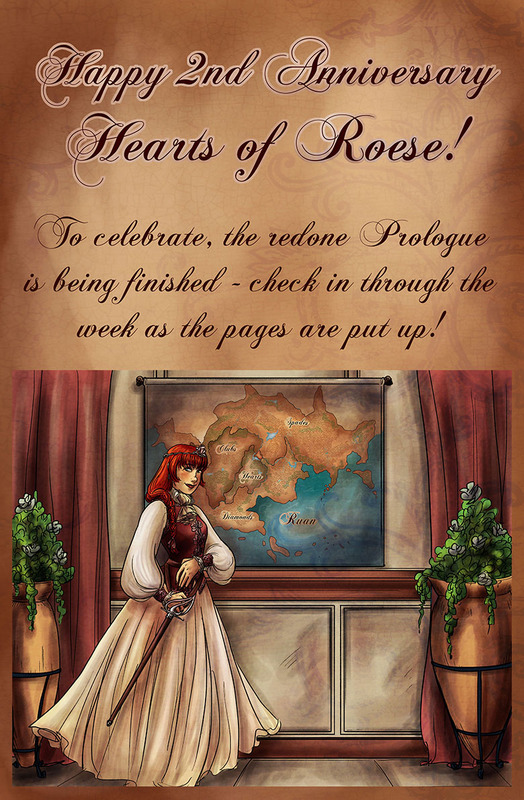 Wow, Hearts of Roese has been up for two years! I know I’ve had a pretty nasty track record on updating, but this week there are going to be six pages! Pages that count as new and old. When I first launched this comic, I rushed through the Prologue because it holds information very important to the story, but I was so excited to start on the main storyline that I didn’t put the time into developing parts of the world I wasn’t quite sure of for those initial pages. In the two years since I’ve started the comic though, that development has happened and I am very excited about sharing the updated Prologue which will give peeks into the rest of the world the story takes place in. Today, the redone page 1 has gone up. Check it out! I will add the links here as the rest of the pages are replaced, and when they are all up I’ll put up a News announcement with all the links. The remaining 5 pages are all in the final stages of coloring, and will be put up one by one as I finish them. Now to hope for some birthday cake to stuff my face with as I continue coloring.